Vloggers Faked a Surveillance Video, But Did They Destroy hitchBOT? Jesse Wellens and Ed Bassmaster were the last people to see hitchBOT in one piece when they took the robot on a ride in their truck on Friday night/Saturday morning. Wellens and Bassmaster are minor YouTube celebrities who filmed their interactions with hitchBOT for the vlog BFvsGF. On Saturday night Wellens tweeted that he was going to try to obtain any security footage from the area where hitchBOT was allegedly destroyed. By Sunday night he claimed to have gotten the surveillance footage, using the hashtag #PvPNews, which references another YouTube channel run by Wellens, Prank vs Prank. The fake surveillance video shows a man believed to be Ed Bassmaster kicking what we’re led to believe is hitchBOT sitting on a bench. The problem? We can’t see hitchBOT because he’s obstructed by a trash can, though we can see Bassmaster rip off what appear to be hitchBOT’s arms. Bassmaster often plays a character called Always Teste, which is the name he gave to local reporters. Wellens first posted a snippet of the “surveillance footage” on his Snapchat, but later handed over the footage below to reporters. As you can see it looks amateurishly staged, poorly acted, and has clearly been given artificial grain and distortion. 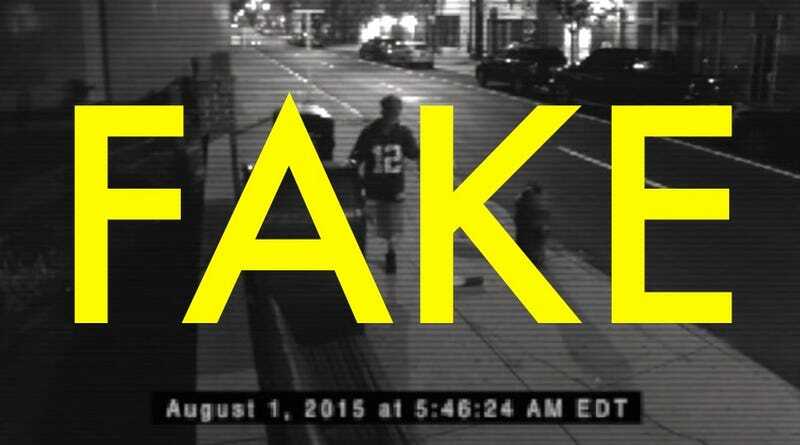 Security footage hasn’t looked like this since the 1990s, bros.
Another sign pointing to the video being fake? As many commenters and the local news stations pointed out, there’s no surveillance cameras from that perspective on that street. But even if they faked the video footage, it’s still unclear whether they actually destroyed the bot. The Canadian researchers who created hitchBOT have not filed a police report, though they were sent the photo below on Saturday before it went viral on social media. The photo shows hitchBOT without his head and with his arms detached. “We have no interest in pressing charges or finding the people who vandalized hitchBOT; we wish to remember the good times, and we encourage hitchBOT’s friends and fans to do the same,” the researchers wrote. Despite this, Bassmaster staged an online performance last night as his alter ego Always Teste, insinuating that the police were after him for what he’d done to hitchBOT. Making things even more complicated, one early photo to emerge of a headless hitchBOT was one that I found on Twitter. It showed hitchBOT buckled up in the backseat of a car. That photo was deleted from Twitter not long after my post went up on Saturday evening. “So my buddy just picked up #hitchBOTinUSA In philly and his electronics are gone along with his head,” the tweet from JohnnyBurton88 read. This account would provide a slightly different timeline from the information sent to the researchers. Was hitchBOT picked up one last time after the “attack” by Bassmaster? According to the Guardian, some passersby sent the photo above on Saturday and claimed that hitchBOT was unsalvageable. “They sent us images and it’s really beyond repair. There’s not a single wire inside and all the things are broken,” the researchers told The Guardian. Nobody seems to know where hitchBOT’s remains currently reside. Did Wellens and Bassmaster disassemble hitchBOT as a “prank?” Did they send the message to the Canadian researchers? And if so, what’s the prank? Is media attention in and of itself a prank? I guess it might be, in the same way that streaking at a baseball game might be a prank. People were already watching the game, but good thing you made it about you, guys. The target audience for Wellens and Bassmaster’s videos appear to be tween glue huffers and the chronically bro. So honestly, I don’t expect the big reveal from these guys to be anything profound. But who knows? After such widespread condemnation online, even from long-time fans, Wellens and Bassmaster (in character or not) might be regretting their decision to get involved with hitchBOT at all. Update, August 5: Wellens and Bassmaster have posted a video showing how they faked the surveillance footage, but deny they had anything to do with hitchBOT’s destruction.